The Beatles sang about a magical life in their cheerful yellow submarine, but can you imagine confining yourself to nothing but a boat and the open ocean for nearly two months? 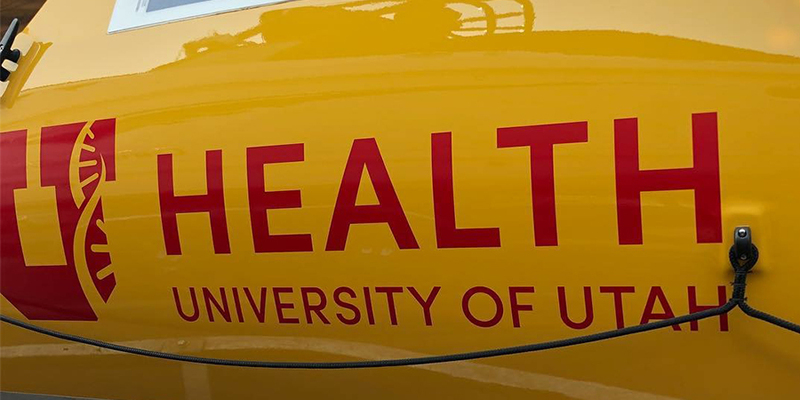 We recently shared the story of University of Utah Health patient Alan Alderman, who will attempt to become the first person ever to row the Talisker Whisky Atlantic Challenge while battling ALS. Now, learn more about the boat that will help Alan and the Row4ALS team achieve this daring goal. Measuring just 28 feet long—about half the length of a standard bowling alley—and 70 inches wide, this space is where the five-person crew will eat, sleep, shower, maintain supplies, and store any personal effects while on board. We had to design for functionality, but also with the idea that this is where we’re living for 45-60 days,” explains team captain Tim Ryan. “Our goal was maximum efficiency in terms of space, storage and performance, but we also had to make it livable. In addition to creating a boat that could carry the team members and supplies, ROW4ALS also wanted a boat that could win. 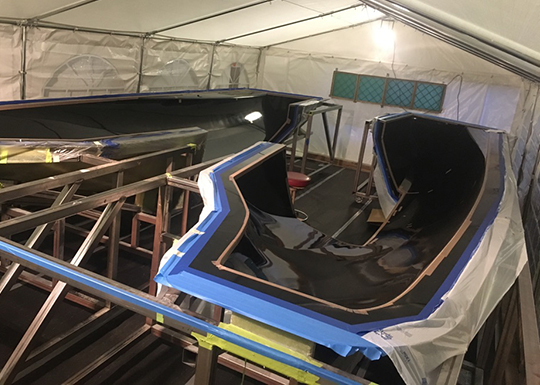 Completely manufactured by hand, based on team specifications, the boat is made from sheets of hand layered carbon fiber, which keeps the boat light and maneuverable, weighing in at only 400 pounds. The carbon construction is also extremely strong. Pieces of the boat are molded individually, then fastened together with carbon fiber tape. Each section is carefully engineered to make the best use of its limited space. The top inside contains working row space where two to three crew members at a time will be at the oars. The bottom of the boat is divided into 20 water tight compartments containing vital equipment and food storage. According to Tim, about 80 percent of cargo on the craft will be food to fuel the team on their journey, including 900 freeze dried meals, 200 tuna pouches, 600 Snickers bars, and assorted protein bars and snacks. The bright yellow boat boasts an impressive seven-panel solar system, which will harness energy into battery storage on board, powering navigation and emergency systems. The team will use a state-of-the-art Garmin GPS with three screens for wind, weather, and mapping. There are also three satellite phones on board, used for standard nautical communications throughout the race. 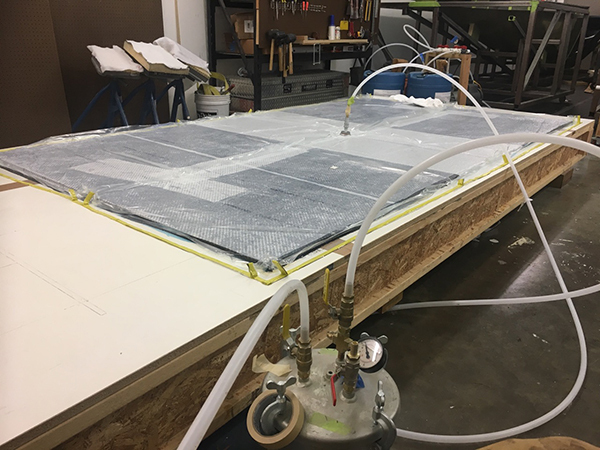 An electric desalination water system takes up 3 cubic feet and will produce the 20 liters (a little over 5 gallons) of water per day the team needs to stay hydrated on the course. Making adjustments to the boat’s design in order to accommodate Alan added another element to the team’s preparation, but also helped shed light on ways to minimize obstacles for everyone. Despite slowed mobility, Alan can move freely around the boat thanks to hand rails. Modifications, such as a sliding row track, help Alan and the other rowers change positions quickly and create a clear path from rowing positions to cabins which improves overall efficiency and safety. The front and back of the boat also contain sleeping areas for the crew and provide a place to hunker down in foul weather. “We’ve already put it to the test,” comments Dale Smith, another dedicated rower on the team. During a training row at Bear Lake, the group experienced a severe wind storm that made it impossible to row safely. Alan and Dale were able to shelter in the back of the boat, with the remaining three crew members in the front. While conditions are tight, each bay measures between 6-8 ft, so team members are able to stretch out to full length when resting. This is what it could be like during the race. We can all fit in there somewhat comfortably—now we just have to put up with each other,” jokes Dale. Kidding aside, the camaraderie among team members already runs deep. When asked separately about the best thing on the boat, among all the special features, each rower shares the same reply—the people on board. Look for more information about Alan, the boat, and ROW4ALS in upcoming articles, and don’t miss your chance to check out the big yellow boat and meet the team over Labor Day Weekend when they conduct a three-day training run at the Great Salt Lake.